It’s lunchtime at the Black Hole Bistro, an in-house restaurant at Waterloo’s Perimeter Institute for Theoretical Physics. Amid the mounting clatter and chatter, conversation at a corner table moves from one universal subject to another: from the questionable authenticity of the buffet chicken to the union of quantum mechanics and general relativity. The marriage of these two theories of the universe—incomplete on their own, but incompatible with each other—is the coveted Rosetta stone of physics. Quantum theory pertains to things on a very small scale, such as particles; it’s important for the study of chemistry and atomic physics. Relativity pertains to the very large, such as gravity; it’s important for the study of astronomy and cosmology. A successful soufflé of particles with gravity, so to speak, would amount to nothing less than the “theory of everything,” or TOE, that has eluded physicists ever since their ancestor Einstein lay on his deathbed frantically running the equations in his head. Most physicists don’t lose any sleep over the fact that the universe is divided into two theories. In fact, only a select few—maybe 2 percent worldwide—spend any significant amount of time thinking about it-. Many of them can be found at the Perimeter Institute, obsessing over the problem around the clock. To wit, one faculty member, England’s Lucien Hardy, regularly arrives at Perimeter just in time for lunch, having worked into the wee hours of the night (nighttime being the only time when the bustle of the place falls quiet). Lee Smolin, Perimeter’s reluctant éminence grise—and author of the recent book The Trouble With Physics—also arrives at work not much before twelve this Wednesday, having made the commute from Toronto. He wanders into the Bistro and settles himself down across the way. The amenities put Perimeter on par with the renowned Institute for Advanced Study (IAS) in Princeton, New Jersey, where Einstein worked on his theory of everything. Located on an eight-hundred-acre site of woods, farm fields and wetlands, IAS opened in the 1930s as an exclusive retreat for intellectual inquiry. The abundant natural beauty of the grounds, the IAS website boasts, “provide a tranquil environment for Institute scholars…” A relaxed state of mind can be the precursor to brilliant insight. At Perimeter, angst can be exorcised with a contemplative walk through the trees, by staring into space by the courtyard reflection pond, and on the hybrid squash-basketball court, on the treadmills, or at the snooker or foosball tables. The hallmark of the institute is its six lounges with no clocks, fleets of plump leather-upholstered couches and armchairs, Gaggia espresso machines and wood-burning fireplaces. The lounges are the collaborative hearth of Perimeter. This is where physicists meet—by plan or serendipity—and pound theories into theorems on ceiling-to-floor blackboards. The blackboards are everywhere. “There is a subtle pressure—you should be calculating,” admits former executive director Howard Burton, who was recruited by Lazaridis to envision and execute the blueprint for Perimeter. These reusable writing surfaces cover at least one entire wall in each office and await stray thoughts in hallways and alcoves. Some are fashioned from weighty half-inch slabs of slate; others are makeshift (a wall painted black to match the décor and hijacked for a more applied purpose). All are crammed with alphanumeric sentences that speak only to those fluent in the language. Occasionally a few recognizable phrases pop out, revealing if not the theory of everything then at least a union between the two cultures of science and art. One blackboard spells out, “Energy = mass x speed of light”; while another declares, “I Love Keats.” The halls and walls of Perimeter are also tastefully adorned with non-scientific works of art; where a blackboard doesn’t lurk around the corner, a painting or piece of sculpture does. Lee Smolin, 52, is a stylishly unkempt character in ubiquitous black with an observer’s alert eyes. A native New Yorker, Smolin is known for his theory of “cosmological natural selection” which argues that Darwin’s explanation for natural selection is also the explanation for the selection of laws governing the universe. He began his career in the late 1970s in elementary particle physics, but by the 1980s he became frustrated with the lack of progress and switched to loop quantum gravity, an alternative route on the road to unification. Last fall Smolin published The Trouble With Physics, his third and most successful book. The trouble, in Smolin’s view, is not so much the pesky incompatible theories, but rather the incompatibility of some physicists—their hierarchical, competitive, uncommunicative and exclusive sociology. Smolin’s exposé, well-intentioned though it was, ignited a fire-storm in the field, precipitating a “vitriolic blog” and “string wars”—warring camps of physicists divided between those who believe string theory to be the only game in town, and those who do not. The media darling string theory, first developed and explored in the 1960s and 1970s, supposes that the smallest component parts of matter are filaments of energy that vibrate like violin strings in a hypothetical and infinitesimally small realm of ten, eleven or even twenty-six dimensions—the physicists added extra dimensions to help explain their theories’ calculations, which are only consistent, or viable, in certain dimensions. As crazy as it sounds, these extra dimensions could very well exist. They could be very small and “compactified,” as the string theorists would say, within our traditional four-dimensional space-time, without us noticing. But leave it to the physicists to figure out, as they have been doing for several decades with a degree of success. The first strings revolution occurred in 1984, inflating the field from a few pioneers to hundreds of zealots. The next revolution, the duality revolution of 1995, related different strands of string theory through “duality transformations. Lately however, there has been considerable consternation over string theory’s future. Data on the reality of strings may soon be on its way. In May 2008, after some delay, the Large Hadron Collider (LHC)—the biggest and most expensive human experiment ever—starts colliding proton particles at 99.999999 percent of the speed of light around a 27-kilometre oval track tunneled beneath bucolic fields straddling the border of France and Switzerland. This is a classic physics trick: if you want to understand something, shoot an energetic particle through it and see what happens. In this case, shooting particles through particles may create “sparticles,” a hypothetical super-small supersymmetric species of particle whose existence would score a few points for string theory. Either way, theoretical physicists are crossing their fingers and counting down the days, hoping the LHC proves, or disproves, something—anything—about string theory. Grumblings are that if data does not arrive soon the theory will be demoted to a branch of mathematics. Smolin argues in his book that a premature belief in string theory, an untested theory dominating the field of unification theory within physics for decades now, threatens to damage the credibility of the enterprise. “Science is based on evidence, not belief,” says Smolin. It’s time, he urges, to turn some attention to what might come next. 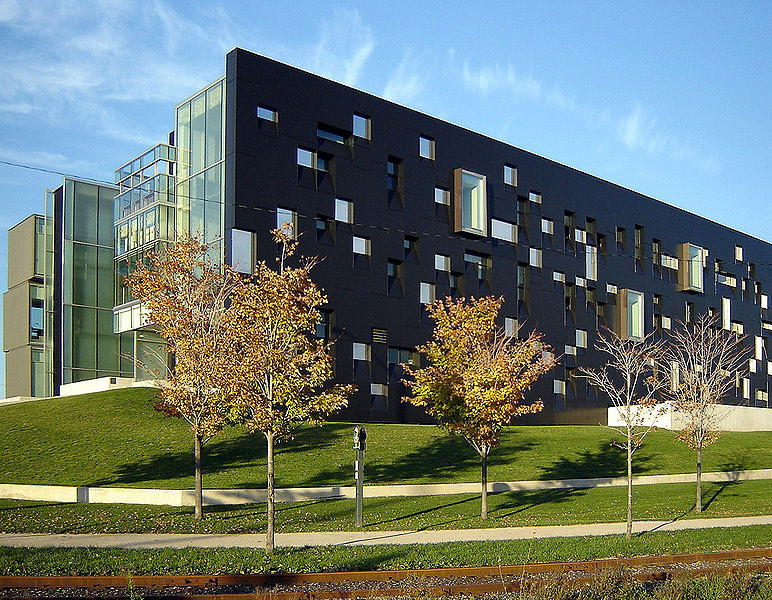 Which is precisely the purpose of the Perimeter Institute. Yet, it is theoretical research that leads to revolutionary breakthroughs, the paradigm shifts that only happen once a century or so—like Einstein’s relativity coup in 1905. “The [scientific funding] climate is set up such that results are the name of the game,” Lazaridis told a reporter from Science magazine. “It’s easy to get business to fund research that will pay off in one or two years; government will fund research that pays off in ten years. How do you handle the generational stuff?” How to seed the next revolution? What happened at the beginning of the universe? Why is the universe so nicely suited for living things? What is the distinction between matter, space and time? If quantum theory and general relativity are united, will our concept of time survive? What’s all this thinking good for? What’s the killer application? Perimeter’s answer: We don’t know. Yet. No one knew that James Clerk Maxwell’s 1864 electromagnetism equations would lead to Guglielmo Marconi’s 1909 Nobel Prize for Physics for his contribution to the development of wireless telegraphy (the invention of the radio). Nor that Einstein’s 1917 paper on the quantum theory of radiation would lead to the laser in 1958. Bilson-Thompson, 33, is a playful scientist who wears a perennial pony-tail and fleece. He became aware of Perimeter after reading an early article by Smolin, published in New Scientist, which discussed the problem of students not being able to pursue their own ideas. The article touted Perimeter as an exception. Later, when Bilson-Thompson was offered a place there, he visited and was attracted by its unconventional model of investigation and exploration. The traditional academic model is monastic, a closed cloister that encourages the preservation of established knowledge, rather than cracking open anything new. In the physics community at large, the string theory camp is particularly closed off, driven by egos and elitism. Graduate students in their prime slave away, “heads down, bum up, working to get results to satisfy their advisors,” Bilson-Thompson says. “It’s a shame that so many people work on string theory at the expense of other directions,” he adds, echoing one of the main points in Smolin’s book. Smolin is a mid-level theoretical physicist, but his popular book-writing activities and the related promotional hustling have given him a platform high above that merited by his physics accomplishments. Smolin is no Chicken Little. He is, if anything, a Don Quixote figure. If physical theories are like ships, then Smolin is a most enthusiastic ship designer…How do Smolin’s vessels fare after launching?…Smolin never seems to notice that he is standing astride the bridge of a sunken ship. He cannot understand why the best physicists in the world don’t pay as much attention to loop gravity as they do to string theory. While in Stanford on his book tour, Smolin wanted to mount a debate on the subject. But Susskind refused the invitation. “The nature of science is that you don’t have agreement,” Smolin says. “You form a community of people who agree to disagree…You query each other, you keep each other honest.” When agreement does come, he says, it is forced by the irrefutable evidence. Disagreement, debate and discussion are the bread and butter of Perimeter, a colony populated by physicists of all stripes. With nearly eighty physicists on-site (faculty, members, affiliates, post-docs and graduate students), there is an equal split between supporters of string theory and quantum gravity, but there are also cosmologists and particle physicists and quantum information theorists. Despite the wide spectrum of perspectives, the tone is cordial and respectful, without any polemics. “If you want to see a fight,” Smolin says over lunch to cosmologist Max Tegmark (visiting from the Massachusetts Institute of Technology and expecting to see some fireworks among the diversity of Perimeter physicists), “then come back when Lenny is here. Then there will be lots of polemics.” Susskind was scheduled to visit Perimeter for three weeks in March, and again for two weeks in June. “I think the value of asking fundamental questions is to get past these apparent differences,” says Bilson-Thompson. This is the best way to shed the light on the underlying similarities of physical phenomena. “And when we do,” he says, “we’ll smack ourselves on the foreheads and wonder at how we could have missed something so beautifully obvious for so long.” He likens the fundamental questions quest to Christopher Columbus’ explorations, venturing into the unknown Atlantic Ocean in the fifteenth century. Columbus set off into a fearsome and endless sea not knowing what he would find. Was a speck of land on the horizon an island, or the coastline of a continent? “Most people don’t like crises or paradox, but theoretical physicists love them,” says Nima Arkani-Hamed, speaking at Perimeter’s monthly public lecture series, which often draws audiences of 500-plus (the talks are advertised with the assurance that “no mathematical or scientific knowledge is necessary or assumed”). Whether anybody but the “boffins in the box” will pay attention to this imminent revolution is another question. Perimeter’s Director of External Relations and Outreach, John Matlock, knows this battle intimately. Arkani-Hamed’s public lecture was the perfect opportunity for a media scrum the likes of which are usually reserved for Lord Black. Matlock could see the headlines:”Canadian prodigy comes home to prophesy the future of the universe.” And in the end he was happy enough with the smattering of coverage. Discovery Channel did an interview with Arkani-Hamed. TVO broadcast his talk, twice, on Big Ideas. The Globe and Mail ran a front-page story on a slow-news-day Monday, covering a heartstrings-pulling story involving a reunion between Arkani-Hamed and his eighth-grade math teacher, who was chauffeured to the event. But there were also a few disappointing cancellations. CBC’s The Hour cancelled on the day of the event. The National’s early interest didn’t endure. And one of Canada’s general-interest news magazines initially seemed game, but in the end the reporter could only report (to a frustrated Matlock) that his editors decided to pass. The reporter admitted that he kind of knew why—having taken a look at Arkani-Hamed’s website, he was befuddled; he couldn’t understand a thing. Physics doesn’t always translate so easily into lay speak, he lamented. If only the reporter had put a few more kilojoules into the research, he might have discovered that that very incomprehensibility is the story: the state of the union in physics, so to speak, is such that even the physicists can’t quite grock the galactic quandary they’ve gotten themselves into. A few weeks after her husband’s epiphany about quantum gravity, Markopoulou-Kalamara left him alone in Waterloo and decamped to Toronto for the weekend. “He was getting unbearable,” she says, adding all the same that to see him, “you wouldn’t know he has doubts…he appears very much in control.” Dreyer has since pulled himself together. He formally recorded his idea, transcribing it from his head to a piece of paper, and gave a draft to Markopoulou-Kalamara and Smolin. They had a few questions. Dreyer is now working on the answers. Markopoulou-Kalamara, meanwhile, has just bitten off another chunk of a fundamental question. “I look forward to a few months of confusion,” she says. As for Smolin, he said “Hello” when Susskind arrived for his visit at Perimeter in March, but got a tepid response. “It was in a tone that gave me the impression he had no interest in speaking to me,” he says. “No, I lost them over there,” the physicist says, pointing off into the darkness. “Then why on earth are you looking for them here?” asks the stranger. “Because this is where the light is,” says the physicist. The joke seems a perfect metaphor for the current conundrum in physics. Smolin points out, though, that sometimes looking for a long time in the same spot of light does indeed yield results. Other times, he says, you need to pick up the street lamp and move it over to the darkness. And then there are the times you have to set off a fire-storm and search by the photons of the flames.